6 white ceramic lettered pumpkins spell out "wicked"
Various sized pieces: smallest stands 2" tall; biggest stands 4"
Every now and again certain people will need things spelled out for them before they are fully capable of understanding what's going on. Well, you can avoid having to go out of your way in order to explain exactly what type of vibe or theme you are going for in your home or outside in your front yard this Halloween. 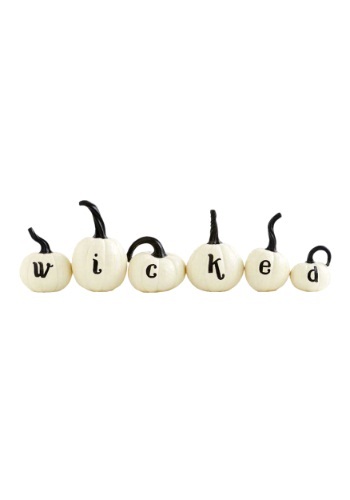 Simply place this Set of Six White 'Wicked' Pumpkins on your front porch or on a mantle above your fireplace. If people are still having a hard time understanding the look you're hoping to achieve this holiday, make these wicked white pumpkins the centerpiece on your dining table and highlight it with some spooky candles and other scary decorations! If they are still struggling then we are sorry to say but, they are obviously not the type to celebrate this most haunting of nights and you should ask them to immediately leave your home.